I've been working on the direct-sales pitch for my new cloud service. —You sir! How much do you pay for downtime? —Why, I have no idea. I take out a calculator. A big one. —Well, how many servers do you have? A thousand? —And how often are they down? —Let me hazard a guess: too often! Is that right? —Why I think it is. —Then do you know what that means? I show him the results on the calculator. —It means you're paying too much! —Tell me something. When your servers are down, what do your employees do? —I bet they do. I bet some of them look very upset. And they run around, worrying and flapping about, am I right? —And some of them, some of them don't do anything at all do they? When the servers are down they shut down too, right? —That's right! They sit there. Like fish. —Fish don't sit, but I've seen it before. Do you know what it means? —It means they don't know *what* to do! The ones who are sitting like fish. The ones who are flapping their arms. The ones who look upset. All of them are utterly unsure of what they should be doing. They lack the experience. They're out of their depth. They don't have even the slightest clue about what's gone wrong and what the damn hell they ought to do about it. You need to turn to an expert. —I do! I do need to turn to an expert. —Well, that's where we come in! We offer Downtime as a Service, look at our specialty downtime data centre! —We have a "Five Zeros of Uptime" guarantee. Even Amazon can't keep up. 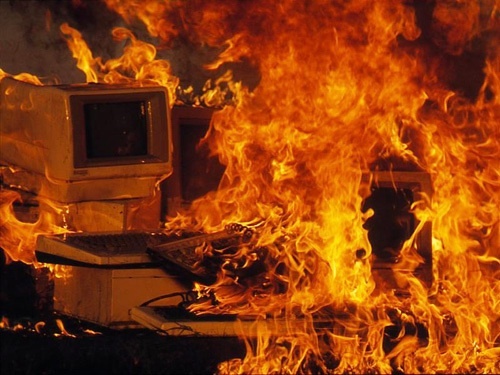 —Our redundant Dell Storage array has incapacity to spare. We're from the internet. We know things. And before he can say "boo" I've signed him up to an Enterprise Plan with our no lock-in guarantee (you're still free to get downtime from all your regular vendors) and he's shaking his head and thanking me as he staggers away, a little happier, a little safer, and a whole lot poorer. That's the plan anyway. Mostly I lose them around the bit where I say "You sir". But maybe next time. 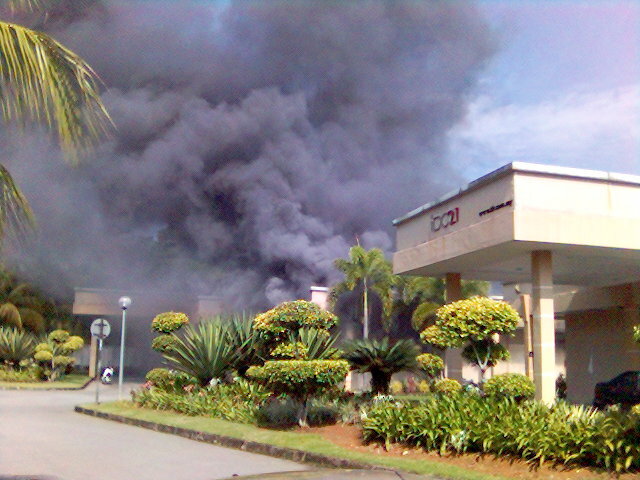 Image of billowing data centre from The fire ate my backup. Flaming computer image found here, but no credit available for the photographer. 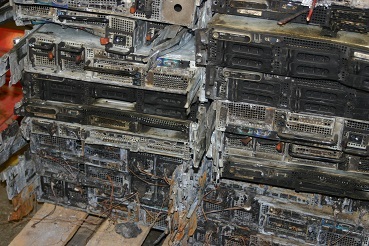 Charred Dell servers from Rob Smith, here. And see also /dev/null as a Service and S4, the write-only storage provider.